Fancy a safari? Good news! You don't have to travel all the way across the sea, battle mosquitos, and sear in the heat to catch a glimpse of a gorgeous giraffe. 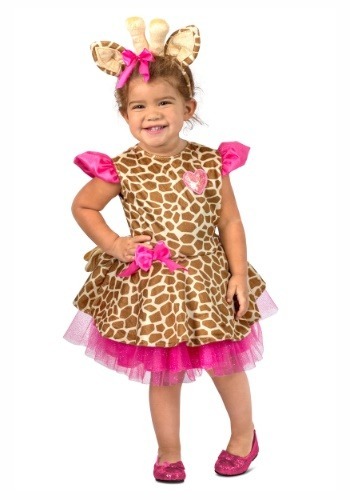 Just put your child in this Toddler's Gigi Giraffe Costume, let her roam the backyard, and hold onto your binoculars! Of course, there are other animals to see on a safari, but aren't giraffes the coolest ones? Lions are great, but we wouldn't want to be face-to-face with one. And FYI, zebras are basically horses with stripes. But giraffes—if you really stop to look at them, they are remarkable! Their long necks, their cute little horns, their mesmerizing pattern of spots...we bet this is why your tot is so taken with them, too! So, put her into this cute giraffe-styled dress and she can feel like both the wild animal and the little princess she is! This sweet look is neither pure costume nor pure fancy dress—it's a little of both! 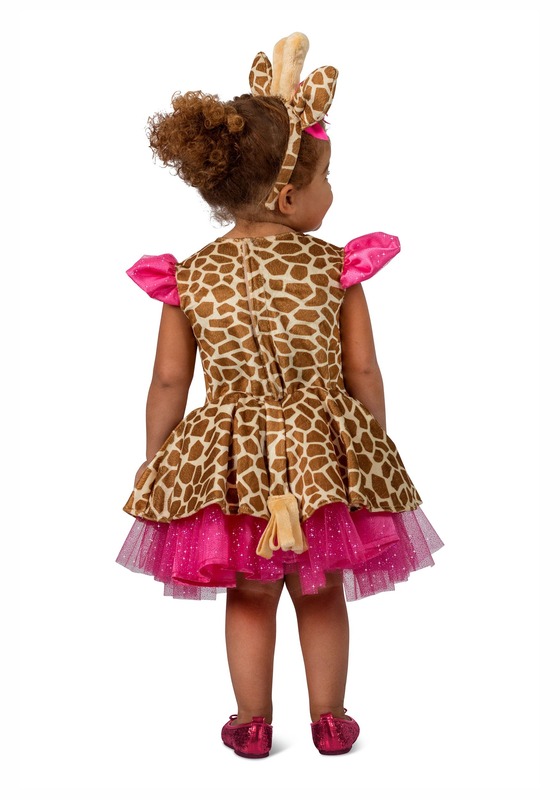 So if your little one loves to play dress-up, she will especially love this tutu-styled dress with its giraffe accents. It features a sparkly pink, layered tulle skirt with matching shoulder details (what's not to love? ), topped in a soft giraffe-print overlay. There's a heart on the chest and a pretty pink bow, which matches the one on the ear-and-horn headband! This look is whimsical, wild, winsome, and a total winner, if you ask her! Kids know what dogs, cows, chickens, ducks, and even whales say, but what does a giraffe say? Well, as it turns out, not much. They sometimes do this weird hum/moan thing, but maybe your kid can make up a catchy poem or song to go with this outfit. It'll be much cuter!